The Copenhagen summit is the best time for us to have a peep-in on this menace which looms over our heads threatening to push the world to anarchy, the Global Warming. Fact or fiction, science or pseudoscience, Global Warming issue if tackled will well lead to a better world for gen next. It is not possible to close our eyes to the frequent freak weather phenomenons across the sphere, and the balance has been shifting away consistently from the conspiracy theorists. The pie-chart below augments India's argument that the developed world should dip more into their pockets rather than bullying those crawling their way out of poverty. 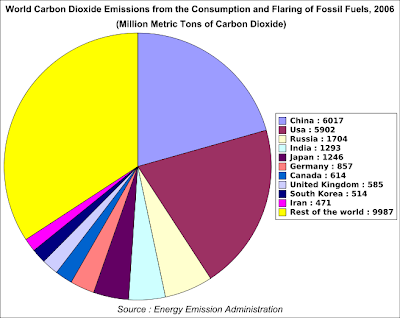 India holds 18% of the world population and produces just 5% of the world's carbon emissions... not a crime. Its no fable that India would be the hardest hit by climate change and we do have an obligation to Mother Earth. We are among the 'big four' polluters, still the average Indian's carbon footprint is eight times smaller than the average person in Britain. Nevertheless, India has pledged to curb its carbon intensity by 24% by 2020. Fair enough. I wonder how candid is this on India, especially since this is the time when we need some serious energy to boost up the economical growth and curtail the poverty problems. The US and Europe have gulped down hydrocarbons en masse to build their muscles but there seems to be not many options available for India. Whatever we do, the Earth would still be 2'C warmer in 2050 or earlier, (much earlier as per recalculations) which puts a question mark over these figures and facts. A 0.6'C rise in temperature over the last century has been accused of the current weather fluctuations across the globe like flash floods, fierce hurricanes, draughts etc. It wouldn't be a nice thought to have a look at the world map where my kids are going to grow, especially these NatGeo and Discovery documentaries are like full blown horror movies when dealing with this topic. Not surprising at all, Kerala's geographical features mean we will be as badly hit by climate change as anyone. The heavily populated western coastal belt and the continuous cris-crossing waterbodies mean that even a slight increase in sea level could mean disaster for the state. All the 3 major cities are coastal ones, the main thoroughfares- NH47 and NH17 are at sealevel which are all exposed to flooding and related disruptions even in the present. This Low Coastal Land (LCL) or areas with <8m elevation from sea level faces a real bleak future. Apart from being heavily populated, this area is a powerhouse driving the Kerala economy viz fisheries, coir and tourism industries. Heavyweight industries of KMML, TTP etc, Ezhimala Naval Academy, Cochin Port, Naval Base, Trivandrum Int'l Airport are some of the major investments in this zone. The predictions of Global Climate Change impacts on Kerala is not rosy at all, here are some excerpts from the Climate Change Catastrophe: Insulating Kerala by Conclave of Senior Academics and Scientists:(COSAS). Mind you, these are not exhaustive predictions but a mere paradigm. Severe degradation of wetland ecosystem. Saline intrusion into backwaters, canals and river channels will affect the flora & fauna including the paddy cultivation in Kuttanad. Increase in mean temperature of the Western coast affecting the tourism potentials. Severe erosion of beaches in LCL coastline affecting mass migration into midlands and highlands. Civic amenities in cities disrupted or rendered useless. Long warmer spells and inconsistent wet seasons may spell doom for plantation crops thus affecting agro-biodiversity.